The StuG.III (Sd.Kfz.142), based on the widely used Panzer III family of tanks, evolved into a very capable German tank destroyer during WWII. In fact, the StuG.III was Germany’s most widely manufactured armored fighting vehicle of the war. As enemy tanks improved their protection and armament, Germany responded by fitting the 7.5cm StuK 40 L/48 gun inside the vehicle’s casemate. This variant was known as the Ausf.G, of which 7,720 were produced from December 1942 through till April 1945. This made the Ausf.G the most common German tank destroyer variant by far, and hence one of the most popular amongst modelers too. Dragon’s newest 1/35 scale StuG.III Smart Kit depicts an Ausf.G model from the December 1943 Production timeframe. This means it displays unique features such as a cast gun mantlet (Saukopfblend) and it also has new sprocket wheels without any hub caps. The steel return rollers are brand new for this late-1943 variant too. The protective side skirts (Schu"rzen) are provided as separate metal plates that lend themselves perfectly to the task of replicating those on the original vehicle. Other photo-etched parts are included for components such as fender details, air intake grills and idler wheel rings. This is another fine StuG.III Ausf.G kit from Dragon – a December 1943 vehicle. This latest kit provides an Ausf. G without "zimmerit" paste coating, both a welded and a "Saukopf" mantlet, a new set of solid cast return rollers, new driver faces, and new fenders and hull details. But from comments on the Internet it seems to be that it should have had zimmerit factory installed for the date it was built and also not come with the "Saukopf" mantlet as that was (according to the only source I saw that noted it) not available until April 1944 and then only from Alkett. I leave it to those wiser than I on StuG III models to figure out what DML was trying to produce. It uses most of the past sprues Panzer III and StuG fans are familiar with, such as the seven-in-one wheel sprue, lower hull and driveline fittings, and the long 7.5 cm interior parts. The same 20-piece etched brass fret is included with the wheel rims and the air intake and exhaust grilles on the engine deck plus some non-slip gridding. It also comes with the styrene mounts and etched nickel schurtzen protective shielding. Technical assistance was provided by Steven Van Beveren, Tom Cockle and Gary Edmundson. Three different finishing options and a targeted Cartograf decal sheet are provided: StuG.Kp. 1019, 19th Luftwaffe Felddivision, Ukraine 1944 (sand with green and brown overspray, white 127); StuG.Brig. 226, East Prussia 1945 (whitewash over sand, black 1068); and Pz.Jg.Abt. 2, 12th Panzer Division, Estonia 1944 (whitewash blotches over sand, black 221). Overall it seems that with too many trips to the same well DML may have missed the boat on this kit, if the comments by German armor fans and historians are correct. But many modelers have seen this version as the "real deal" StuG III and will probably be happy with it, errors and all. The Sturmgeschutz III assault gun, built on the chassis of the Panzerkampfwagen III, was eventually to become one of Germany's most successful tank destroyers. Intially fitted with a low-velocity 75 mm StuK 37 L/24 gun, the subject of this kit, a December 1943 production Ausf.G was fitted with the longer barrelled 75mm StuK L/48. A sort of odd one to review this. I feel an odd sense of Deja vu, probably because it's all been seen before. This kit is virtually the same as the Cyber-Hobby 'Black Knight StuG.III Ausf.G released back in November 2010. So before you go any further, take a look here. First off, to be really accurate it needs a Zimmerit coating. If you're wanting an accurate December 1943 production StuG.III Ausf.G then Atak produces resin sets that fit, with both the Alkett 'Waffle' type and MIAG 'tile' type Zimmerit. The return rollers included in the kit are supplied as said, on one of the two new small sprues, and they're of the type fitted to the MIAG version. By this time the Alkett version also had all steel return rollers fitted, but these were without the triangular radial ribs and also had lightning holes....and that type aren't supplied in the kit. Alkett had by now also changed their fender supports to the stamped type, whilst MIAG had held on to their tubular type, with the kit instructions indicating that the pressed Alkett type supports should be used. The engine deck is also of an interlocked welded design only seen on Alkett versions at this time, and not on MIAG versions until later in 1944. If you want to build an accurate model, reflecting it's production date, rather than just a StuG.III Ausf.G, then the easiest course of action...since the MIAG return rollers are actually included, is to make your model into a MIAG version! This will mean using tubular fender supports, which are thankfully still included in the kit, although they'll need small triangular fillets added, since they're not. (They were originally supplied as PE). Since you'll be adding Zimmerit, the engine deck interlocking welds shouldn't be a problem...since you won't see them. You should also use the two-part bolted mantlet that's included on the E and F sprues, rather than the cast one as indicated on the instructions. The two new outer halves for the drive sprockets also now show bolt detail, and are specific to the MIAG version at this time. There are also two new drive housings supplied to fit either side of the new 80mm thick armoured piece that was welded to the front of the vehicle, and is now supplied as a side sprue on the original sprue L.
The new small decal sheet included covers the necessary markings for the three schemes illustrated on the instructions, two of which are from 1945, and one from 1944. See below for full details. It can't be denied that this is a beautifully engineered and produced model. Let's face it....nearly every new Dragon release these days is! For the modeller that just wants a StuG.III straight from the box, they'll find themselves overjoyed, with an incredibly detailed model that needs no further additions....and let's face it, that's the overwhelming majority of modellers. For the modeller that wants a bit more accuracy, then there's a little more work to do. It's all here in the box....excepting the Zimmerit of course....but you won't be able to rigidly follow the instructions. You'll need to consult your references and sometimes use parts that are marked as 'Not for use', and discard other parts the instructions indicate you should use. It is a little puzzling that these alternatives haven't been pointed out by Dragon on the instructions, especially given that the necessary parts are after all included in the box...but let's just be thankful that they are! 6581, StuG.III Ausf.G Dec. 1943 Production, Smart Kit. 1/35th-scale styrene/multimedia kit. Contains 483 styrene parts (including 13 clear), two bags of Magic Tracks, three etched metal frets, one length of braided metal wire, three water-slide decal marking schemes and eight pages of instructions in 19 steps, plus addendum leaflet. The latest iteration in a still-growing family of Sturmgeschutz III kits purports to allow the modeler to construct an Ausf.G produced in December of 1943. For the most part, the kits designers have got it right regarding the major features. However, since production of the StuG.III Ausf.G was severely disrupted at Alkett by Allied aerial bombing in November of 1943, realistically only MIAG was producing the Ausf.G a scant few weeks later. The key items in this latest release, which point to a MIAG-produced vehicle, are the return rollers. They are the all-steel type with six ribs and no perforations. Reference 6, below, identifies these at MIAG-only types. Therefore, the modeler should beware of using the cast Topfblende gun mantlet, since this has long been acknowledged as being exclusively an Alkett-produced Ausf.G feature. This is not a serious problem since the original welded/bolted gun mantlet is still in the box. The other concern now is that the modeler uses the correct tubular track-guard support brackets, parts G32 and/or G33, instead of the pressed type, parts L5. A triangular sheet metal support will need to be added to the tubular brackets, which is easily done with a bit of scrap sheet styrene. Of course, since September of 1943, MIAG applied Zimmerit in their signature cross-hatch pattern; this is not represented in the kit. Conversely, following the kits instructions to the letter AND drilling six holes in each return roller, will result in an Alkett-produced StuG.III Ausf.G. If thats the chosen route, the modeler also has to add waffle plate Zimmerit. These come loosely packed in a two bags and are so-called Magic Tracks. They represent the 40cm-wide links that had hollow guide horns as well as slots and grooves in the cleat faces. These tracks are also handed, so the modeler is cautioned not to open up the bags and mix things up prior to assembly; as an added bit of help, each sides links are a slightly different color of gray styrene. Being Magic Tracks, they have no sprue attachment points, which is a definite time saver since no cutting or clean-up in that regard is required. Each has a pair of extremely faint ejector pin marks on the inner face. These can be ignored or erased as the modeler sees fit. They fit together easily but quite loosely, and must be fixed together with glue prior to handling. This type of track was introduced in March of 1941 and is reported to have been in use until the wars end, so it is one possible combination with this production batch of the Ausf.G, regardless of manufacturer. The road-wheels are conventionally molded in inner and outer pieces, with integral rubber tires. The outer faces of the wheel hubs feature perforations and weld beads where appropriate, while the tires have a facsimile of the manufacturers logo (ContinentaU) on their rims. On the inner faces, the tubes that helped join the wheel halves together are molded on providing an unprecedented level of detail in this regard. Spare road wheels and spare track pins are also given for stowage. The new MIAG-style return rollers are in two parts (inner and outer halves). They feature six ribs on an all-steel wheel. The drive sprockets come as conventional inner and outer pieces and are completely detailed. Their outer faces are now without the armored hub caps previously seen, so the rim bolts and other details are now given. It should be noted that the center of the hub identifies it as a MIAG type, in use since November of 1943. The idler wheels are also in inner and outer parts, but feature separate hubs as well as etched brass inner rings. The idler wheels also have a separate axle arm which can be very slightly adjusted to accommodate the fitting of the tracks. Separate internal torsion bars are given as are beautifully-detailed separate external swing arms. This will allow the suspension to be fixed in an articulated fashion if the modeler desires to place his work on a base with irregular terrain; to do so, simply cut off the pins that protrude from the hull sides, which are there in case the modeler wants a level, fixed suspension. Bump stops, slide-molded shock absorbers and new final drive housings (as well as mounting plates for the latter, which are tailored for an 80mm bow plate) are also separate parts. The main part of the hull comes from a slide-mold so it is fully detailed on all faces. This includes mounts for the road-wheel torsion bar/swing arm units, idler wheel mount, bump stops and shock absorbers, as well as the various bolted strips that connected the hull to the superstructure. Panel seams and weld beads are also present. The belly has drain plug and access plate detail molded in place, plus bolt and rivet heads, as well as weld beads. It should be noted that by the time this variation was in production, at least the hull sides-to-rear plates featured interlocked weld beads. However, the idler wheel mount covered this feature, so it is not visible on a completed vehicle. The bow plate is separate and its configuration represents the base armor of 80mm. The lower hull rear plate is composed of many separate parts including one version of the exhaust deflector, spacer plates, various access covers, tow points and exhaust pipe/muffler assemblies. These last come with opened pipe ends and separate mounts. Finally, an etched brass screen is provided to be placed under the upper hull plate over-hang. The plate itself also has interlocked weld beads. It also has four rows of cone-headed bolts on its face; remove the outer-most rows on each side for a more accurate configuration. The separate glacis plate depicts the type with an 80mm armor basis. On this is mounted a three-piece Tarnscheinwerfer-Notek black-out driving head-lamp, stem and base. The split-style final drive/brake drum access hatch lids are all separate parts and feature separate internal locking levers. Separate track-guards are provided, with the main parts being detailed on the top and bottom surfaces; neither is marred by ejector pin marks. These are the types with fixed mud-flaps, which are correct for the time in which this Ausf.G variant was produced. There are a number of styrene and etched brass parts added to these main parts so that all braces, etc. can be depicted in great detail. I have mentioned above which track-guard support bracket parts are to be used in combination with other parts in this box. Most of the tools, as well as the five-part jack, two-part, slide-molded jack block, tow cable mounts, end-loops and brackets (with braided metal wire for the cables), fire extinguisher and Tarnscheinwerfer-Notek distance-keeping tail-lamp are attached to the track-guards. It would appear that in March of 1943, the tail-lamp was changed to the tubular type. It is in the box but marked as not for use; use it! The tools have nice clasp details, while the tow cable mounts and jack mounts are separate parts. A number of small wing-nuts are given to detail these items, where appropriate. The engine deck module is a separate part and is configured much like the original; the entire assembly can be left off to depict an engine change. Coming from a slide mold, it has details on all faces including various styles of plate and weld detail as well as attachment flanges and bolt heads. It represents the interlocked type, which was introduced in various forms by various manufacturers, from March to July of 1943. The four engine access hatch lids are separate parts, with proper coaming detail around the hatch openings. The armored guards that surmount the hatch lids are separate parts as are their mounts. A separate tool box as well as gun tube bore swabs and staffs are also mounted here. The latter includes fine separate bracket detail, while more tools are mounted on the side walls. At the sides, the armored guards for the engine cooling air intake vents also have interlocked weld seams. These slide-molded parts attach to the engine deck module, which includes their internal openings. These are topped by etched brass screens, and detailed with, among other items, lift hooks. The casemate is also configured as a separate part and attaches much like the original. It comes from a slide-mold and features excellent weld and panel details, mounting strips and bolt heads, all molded in place. Separate parts are provided for the side lift rings, rear antennae mounts and flexible rubber bases (but STILL no rod antennae for them! ), spare track rack (including separate wing-nuts) and cover for the exhaust fan. The separate roof plate was attached to the casemate with recessed screws; they are properly-rendered here. The commanders cupola is a multi-part affair with clear periscope heads and clear scissors telescope. The separate hatch lid for it is a multi-part affair that includes separate locking latches and rubber bump stop. A cast armor splash guard for the cupola is also provided. The loaders hatch lids are separate and include internal details. The MG shield comes in two variations and can be shown erected of folded-down. The MG34 is a slide-molded Gen2 item complete with opened bore and cooling jacket perforations. It has a separate receiver cover, but no belted ammunition or drum magazines are provided. Up front, the casemate features separate armor plates for (50mm plus bolted on 30mm applique) for both sides. The drivers two-part view port cover can be posed opened or closed, with the internal glass block represented in clear styrene; it is complimented by a separate splash plate. Both the cast Topfblende and welded/bolted mantlets are in the box. Either is properly-rendered and I have mentioned in the introduction which one should be used, depending on the version the modeler wishes to replicate. The gun tube is a single styrene part with a slight seam that will need to be cleaned up; for this I recommend the classic Flex-I-File. The slide-molded muzzle brake is a three-part affair and includes the internal lug and external locking nut. The Schurzen are based on etched aluminum panels with styrene mounting rails and hanging hardware. They are the first type, which has been dated to April of 1943. The plates are given as separate etched aluminum items and are thus rendered in scale thickness; another advantage of this material is that it can be bent to depict battle damage. Furthermore, some (or most) of the plates can be deleted if the modeler wishes. Internally, the 7.5cm StuK40 main gun is complimented by an almost totally complete mount. This includes cradle, recoil cylinders, mount, traverse and elevation hand-wheels, gunners seat, multi-part breech block, sight mounts and clear Sfl.Z.F.1a gun sight. This entire item mounts over the drive shaft tunnel, which in turn, is attached to the floor plate. A bulkhead/engine firewall unit encloses the compartment at the rear. Above that is the inner works of the exhaust fan, which includes a separate fan blade unit. There is also a commanders seat. Separate inner sponson units are detailed with various radio sets along with some of their ancillary accessories. To these are fitted separate mounting racks. Enough equipment is given to create a command vehicle. There is much missing here, although a pair of MP40s are now included, so use em! Some of missing items are standard equipment such as head-phone boxes, gas mask canisters and MP40 ammunition magazine containers. Many modelers will have these in their spares box. Major items such as 7.5cm ammunition racks and lockers, the entire drivers compartment, some vents, pipes and conduits, will all have to be scratch-built or sourced from the after-market industry. In essence, the interior is provided in this manner so that if the hatch lids are depicted in their opened positions, things will be busy enough. Slide-molds have been used in a very intelligent way either to allow for better detail rendition, or for ease of assembly. On visible surfaces, not a single ejector pin mark was found and there was no shrinkage of any kind. Fit of major parts was excellent and mold seams were faint and easily dealt with. As far as I could tell, using the scale drawings in reference 1, 2 and 6, this kit is extremely accurate in its major dimensions, shapes and angles. In the area of omissions I noted the following that would still be of concern to me personally: there are STILL no rod antennae provided. Some minor details need to be tweaked, which I have touched upon above. Finally, the time period in which this assault gun was produced means that Zimmerit is mandatory, but it is not included in the kit. White 127, StuG.Kp.1019, 19.Luftwaffe-Feld-Division, Ukraine 1944. Black 1068, StuG.Brig.226, East Prussia, 1945. The only markings I could confirm are those for white 127. However, they are incomplete. There should be a second set of Tac numbers and a Balkenkreuz on the superstructure sides, aside from those seen on the Schurzen; these are not provided. In addition, the vehicle in question is a later Alkett version as shown by the waffle-plate Zimmerit pattern, factory-installed stowage rack on the engine deck and second style of Schurzen. The latter feature was seen from March of 1944. These are in the conventional drawn style and appear to be well-done. As usual, they are busy. Although this kit is a bit schizophrenic (it does not quite know what version it is), it can be built into an accurate replica of a specific factory type, with what is included in the box. I have provided the basic information for these small tweaks. Doing these things, finding correct markings and adding Zimmerit is all the modeler really needs to be concerned with. That is not an unusual situation for any kit manufacturers product. production Ausf G. Given they were produced in relatively large volumes they are often seen in front line photos, particularly from the Eastern Front where most were deployed. 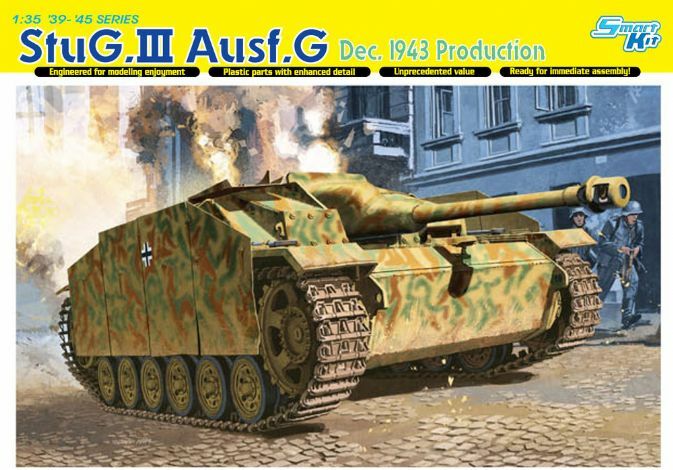 This new release has all the changes which had been introduced to the StuG III Ausf G by December 1943. It is typical of those StuG built in the winter of 1943/44 and includes a spare block/square mantlet to give you flexibility to model specific StuG seen in frontline photos (the old design was still made in 1944). It includes PE for the shurzen (side armor). This release is based on Dragon’s recent Smart Kit StuG III Ausf Gs which are the best 1/35 models of this AFV on the market. With this basis, this kit should also require little clean up of parts, fit together well and be rewarding to make. The gatefold instructions have 20 steps of line drawings that are clearly laid out. Photo etch is provided for the air intake grills, mesh over the air deflector (faced downwards on the hull rear), upper fender supports and detail, centres for the idler wheels, and the internal collar ring of the commander’s cupola. StuG produced around December 1943 had factory applied zimmerit, the pattern depending on which factory assembled the gun. This kit does not include zimmerit; however several aftermarket resin zimmerit sets are available. The superstructure is slide-molded and has a separate roof. Accurate for a December 43 production StuG there is a deflector in front of the commander’s cupola and no smoke grenade launchers. This production series still had the MG42 fired by the loader behind the protection of a small shield. The MG42 is Gen-2 tooling and the gun shield has a separate part for the handle..
Clear plastic parts are provided for the driver’s vision block, cupola vision ports, and the main periscope gun sight. The commander’s hatch has interior details, such as handles and, like the loader’s hatch can be assembled open or closed. The 75mm gun has the curved topfblende mantlet. This is the first design without the hole for a MG. On this kit it is a single slide molded part with detail on the rear face some of which will be visible on the finished kit. The one-piece injection barrel has a separate three part muzzle break. The earlier block mantlet is included as spares, which is useful as due to production constraints many StuG built in early 1944 still had the block mantlet. For the engine deck all four hatches can be modeled open, although you will need to supply your own engine. Weld detail is finely rendered. This StuG includes an interior fitting compartment which will meet most modelers’ needs when the hatches are left open. The StuK 40 gun is quite detailed with the breech, sights, hand wheel, gunner’s seat, recuperator cylinders, and recoil guard. It is attached to a realistic mount that is placed on a floor, which has anti-skid plate, recessed handles for the access points and a transmission tunnel. The rear firewall with the ventilator’s fan housing is included and the side panniers come with two radios mounted in their racks. The commander’s seat is also included. The kit does not include the ammunition racks. The schurzen are built using PE which gives a realistic in scale effect and can be bent to depict frontline service. With each panel being separate it is easy to depict a Panzer missing the odd panel. The panels correctly have cut outs where the schurzen were attached to the mounting rails and this offers the benefit of simplifying assembly. The mounting rails are plastic with one piece angled support brackets. Photos of StuG of this production series tend to have shurzen fitted. The lower hull is based on a one piece tub typical of Smart Kit StuG IIIs, and has revisions to the suspension. The lower hull is well detailed featuring items such as weld seams, drain plugs on the bottom, while most of the bump stops, and the shock absorbers on the sides are integrated into the one piece hull tub. Separate parts are provided for small detail such as the track tension adjusters, and the exhaust pipes have hollowed out ends. The side fenders have an impressive anti-skid pattern on the upper surface and underside and integrated front and rear fenders. The holes for the tools are predrilled. The tools have the brackets and clamps cast on for ease of assembly and the jack is built from four parts plus separate parts for the brackets. The tow cables are made from twisted wire with plastic end eyes. The revised drive sprockets are the later design without hub caps, while the return rollers are the later steel profile (mid 1943 StuG had rubber return rollers). The suspension arms are separate parts. The rear idlers have photo-etched rims and feature the oval shaped lightening holes and raised ribs. The road wheels have the tyre and rim as one piece. The tracks are Magic Tracks where each link comes loose, and for most modelers require no clean up. They are the 40cm wide type with open guide horns and no chevrons on the outer faces, a type that is seen in photos of this production series. Decals are included for three StuG from the Eastern Front. The Cartograf sheet includes three sizes of Balkan Crosses and tactical numbers. The fist gun is from StuG Kp 1019 with the 16 Luftwaffe Felddivision in the Ukraine 1944. It has a dark yellow base with broad green and brown camouflage spray painted on. Matching photos it has large Balkan Crosses and white tactical number 127 on the shurzen. Photos show it had a stowage rack on the rear with stowage. A photo shows that the panniers (casemate sides) had a smaller Balkan Cross (decal 4 on decal sheet) and smaller 127 (white in same font – not on decal sheet) markings. The second StuG is from StuG Brigade 226 when it defended Prussia in rear guard actions in early 1945. It has white wash over a yellow base. Its tactical markings are black 10 68 (included) and dark yellow 220 (shown on instruction sheet, but no decals provided) which may have been achieved by rubbing off the white wash. The third profile is from Panzer Jager Abteilung 2 (Tank destroyer unit 2) with 12 Panzer Division in Estonia 1944. It is also white wash over a yellow base and the shurzen have Balkan crosses and black stencil outlined number 221 on them. Interestingly the StuG in the box art is not profiled on the instruction sheet. It is dark yellow base with broad green and brown camouflage spray painted on and has Balkan Crosses (included on decal sheet) on the shurzen. This new StuG III Ausf G offers a crisp and accurate rendition of a December 1943 to early 1944 production model as seen in many front line photos. It has the advantages of the Smart Kit format, as well as Magic Tracks, interior detail, and metal plates for the shurzen side armor. Well recommended.